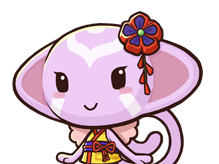 A Halloween-themed art contest where you can integrate any of the creatures from the world of Rakuen (Leebles, Sky Buds, Minimori). 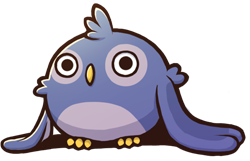 Any type of art is okay so long as it's Halloween themed, and includes a Rakuen creature... Some examples include: drawings, paintings, music, food art, stories, crochet, papercraft, whatever you like~! You'll have until October 30th at 11:59pm PST to submit your art. Please send your entry to supershigi at gmail dot com, or PM me at the forums! The winner of the contest will receive the full 52-track Rakuen Original Soundtrack (which is already completed, just not online yet) before it is released to the public. For reference, here are some examples of the creatures from the world of Rakuen! 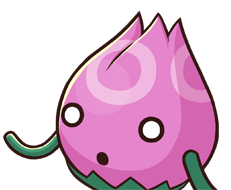 The "Buds" are a race of plantlike creatures that can be found all over Morizora's Forest. The ones who live on the ground call themselves "Cave Buds," the ones who live in the Skylands (the floating islands that are accessible via beanstalk) call themselves "Sky Buds." Sky Buds in particular are known for their extravagant afternoon tea events. Their leader, Monsieur Bud, spares no expense hosing these grand events featuring tea, musical entertainment, and all sorts of fattening foods. Buds often dream of becoming trees, but it rarely ever happens. The "Minimori" are the ubiquitous offspring of the Great Forest Guardian, Morizora. They don't have individual names, but rather, a number that is given to them based on when they came into the world. They refer to one another as "Cousin" along with whatever their number is ("Cousin 7 is doing well these days"). They all have different preferences and career ambitions, but are also on the same wavelength and can read each other's minds. The Minimori all anxiously await Morizora's awakening, and share a profound sadness when he is asleep. They love music, and hear melodies all the time. We all know Leebles don't we? Hehehe... Leebles are social creatures who usually prefer to live in small villages. Their diet consists largely of fish and Sila Berries (a very large and nutritious fruit), though they also enjoy a wide variety of different foods. Leebles can be found practicing anything from cooking to blacksmithing to creating toys, and they always choose their trade based on how they feel they could best contribute to their tribe's prosperity. They have a rich culture, and many seasonal events; their largest one being the yearly "Star Night Festival," where they celebrate the Blue Star that lights their planet. They're never intentionally rude, however, most don't have a speaking filter and subsequently, tend to just blurt out whatever they're thinking at the given moment. Leebles love music, dancing, and in some cases, working out. Good luck everyone! 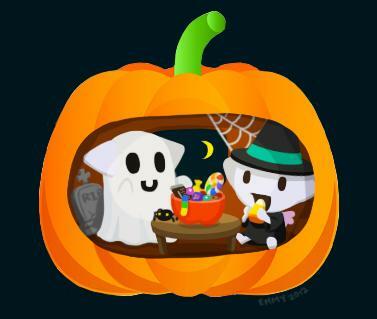 And Happy October~!!!!!!!! I'm excited! I think I have an idea too! A chance to draw cute critters? Yes! Dancing the cabbage patch in thread form. Yay~! I'm so excited to see everyone's artwork! I have an idea! Sorry I haven't been on lately but I can't wait to see all the cool stuff! Waha! I have made an entry! I look forward to seeing everyone else's pieces ^_^ SoHo - I have some lovely demented ideas as well. Thinking of applying the kind of horror make-up my cosplay friends like to some of these creatures. Just sent my entry in via email ^_^ Hope you like it! So sad. Been extra busy and couldn't get a painting in. Excited to see everyone's entries however!!! I submitted mine too last week! Though I didn't get a confirmation email... I'll trust that you got it though hehe! @Krystal: Yup, I did receive your entry~!